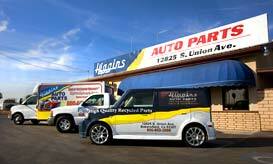 Committed to providing quality recycled auto parts with exceptional customer service. Check out our huge inventory of body and suspension parts, engines, transmissions and more. Don't see what you need? Give us a call M-F 8AM to 5PM Pacific, we're happy to help you with that hard to find part! Buying used auto parts helps keep the earth green!